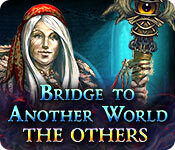 Bridge to Another World: The Others is rated 3.9 out of 5 by 21. Rated 5 out of 5 by rpggramma from Loads of fun!! This one has everything that makes a great game!! That is all I have to say!! YOU WILL LOVE IT!!!! Rated 5 out of 5 by ladynextdoor123 from Nice Game! Enjoyed playing this game from start to finish. The puzzles were fun and different, and the story line made sense. I also liked the scenery and music very much. Rated 5 out of 5 by bessiegirl from total 5 star for me I've never given a total 5 star to a game before, but this one filled the bill. Excellent graphics and animations, voice overs and challenge. Storyline has been used before, but really worked in this game. A long game for a SE with multiple dimensions of gameplay. Totally loved it. HOS were varied and interactive and puzzles were new most of the time. Only "cons" were minor...had to turn the music down, it was a bit annoying, some of the HOS were "shadow" and were black on blue so they could be difficult to see and scene changes were a bit delayed. All minor to a great game. Loved every minute of it. Hard to break away from. Custom setting allows you to set hint/skip recharge which is always good for me. I found the game challenging even on the easy setting and had to use the hint more than I usually do in a game. Transporter map was needed and was very useful. Worth every penny paid. 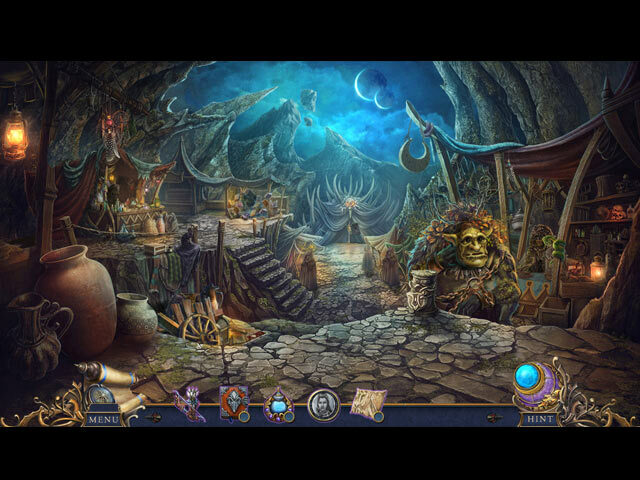 Rated 5 out of 5 by deddu from Wonderful Adventure Great game with lots of fun hidden objects; different mini-games and puzzles. It is a long SE game and most of the time you don't need the hint button as the game follows a logical path. There is also a map to help. Rated 5 out of 5 by judeejuju from Superb! I loved this game. It just got better the more I played. Rated 5 out of 5 by 9otters from Pure FANTASY, IMAGINATION, And FUN! BASED ON COMPLETED GAME Bridge to Another World: The Others, for me, was something NEW AND DIFFERENT. Its almost like an interactive movie, but you won't just be watching, you'll be DOING. Every animation is there for a reason. High quality voice-overs added to the atmosphere. It was so much FUN taking part in the show and I loved the world and its inhabitants. If you're a HOG fan I think you'll enjoy this game as much as I did. The HOS had UNBELIEVABLE variety and, with the mini-games and puzzles, were incorporated into the story in such clever ways. They created a momentum that continued throughout the entire game. Every time I thought I might be coming to the end, there would be another twist and off I'd go again. A good, lengthy game. This game is PURE FANTASY. Friends4Games has created a detailed and complex world with SO much to do and see, its almost like they squeezed TWO games into their competitors' one! For the price of a game coupon you can be a part of another world for a while. That, for me, is what fantasy is all about. I will absolutely be playing this one again. Thank you Friends4Games and BFG!. Rated 5 out of 5 by pennmom36 from A Leap Of Faith During the night of an Eclipse, Jane awoke only to realize she had absolutely no memory of her life, she didn't even remember who her parents were! Confused, with no idea what to do, she wandered into the night and through the woods until she came upon something that would change her life forever. Destiny surely brought her here to save a young boy named Jace from the Dark Other, a witch who was trying to cast a powerful and agonizing spell upon him. Jace and Jane dedicated their lives hunting the "Others" hoping to find a cure for the spell that was cast upon Jace, a curse that alienated them from civilization! Fortunately, you have found a Spellbook belonging to one of the Others, which has been conveniently left behind in the human world, without it, you won't be able to enter the portal to the "Other" side. There's only one problem, to cast a spell you must first find a feather made of chalk, and then replicate the spell symbol on your hand for each spell. The spells will enable you to whip up a spell which allows items to levitate, or even make multiple copies from an original object! Once you are in the Other world, you find another handy item, a Magical Compass that shows you the path taken by someone, in this case the direction Jace took on his frantic chase of Morai, the Other who cast that wicked spell upon him all those years ago. 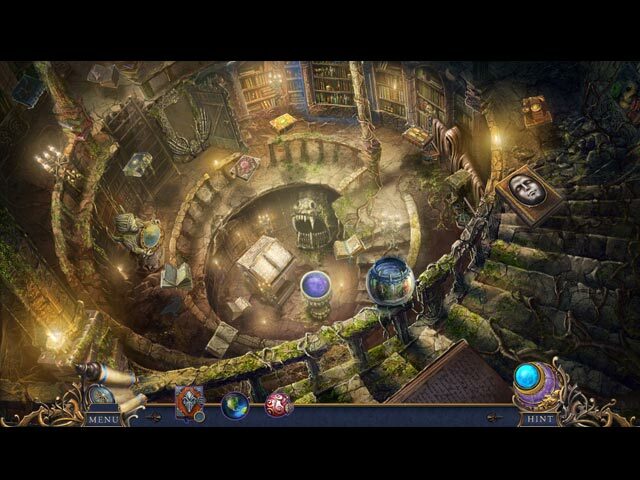 The Compass needs magical powder to activate, and then you play a Hidden Object Game, finding 4 items that match silhouettes shown on the compass for each new direction. Some of the inventory items have plus signs which means that you must interact with that item before using, such as combining that item with another inventory item, or using codes from clues you have found previously. I liked the Collectors Edition better because there are 28 Raven Silhouettes hidden throughout the game. Initially I thought the Ravens were way too obvious, but all that changed once I crossed over to the Other world, as the scenes became darker, the Ravens became much harder to spot! 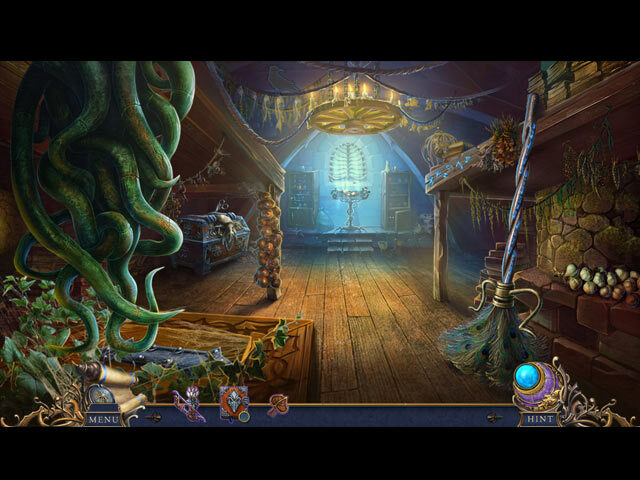 The Hidden Object Scenes are mostly progressive, interactive silhouetted shapes, where you find the first item that matches the silhouetted shape, and use that item to interact with other items that will reveal the next silhouetted item. There are also a ton of smaller HOP's, as I mentioned before, they are required whenever you use the compass, some are within zoomed in areas where you are tasked with finding 5 arrows for example by placing objects in their correct position on a scarecrow, to reveal the arrows. There are even hidden object scenes where you find 4 crescent moons, 4 ravens, and 4 spell symbols, on a book, page by page as the background story of Jace and Jane is being narrated. The Mini Games were far a few between, unless you count the before mentioned HOP's. They do exist however, with quick puzzles where you place round tokens correctly to complete a picture, repeating the sequence of several blinking eyes, or matching identical moon shapes on books by flipping over two books at a time, but if you pick the wrong match, the books scramble into different positions. The Collectors Edition has Achievements, 28 Collectible Raven Silhouettes, replayable Mini Games and Hidden Object Scenes, Screensavers, Wallpapers, Concept Art, Music, Movies, a built in Strategy Guide, and a Bonus Chapter, enjoy! Rated 4 out of 5 by ninja226 from Jane and Jace sitting in a tree This is the 4th game I've played in the series, and it ranks 3rd in my list of favorites. 1st place--Escape from Oz 2nd place--Alice in Shadowland The artwork for this game is not as good as the other 2, being fuzzy compared to the above two. The voiceovers are OK, but on the slow side, and the characters do speak in rhymes, if you like that kind of stuff. The story is just so-so, but the devs have worked hard to make it unique. The quality of the game varies, being excellent in some parts and just average in others. I was spoiled by the exceptional quality of the other 2 games, so this one was a bit of a spoiler. On its own, it remains a good game, just not outstanding and dazzling.